Shannan Monson is a writer holding a Bachelor of Science in dietetics from Brigham Young University. She was awarded Outstanding Dietetics Student of the Year by the Utah Dietetic Association in 2011. Monson is a certified personal trainer through the National Academy of Sports Medicine and specializes in health and fitness. During prolonged and high intensity exercise, many people experience a significant decrease in sodium because of sweating. 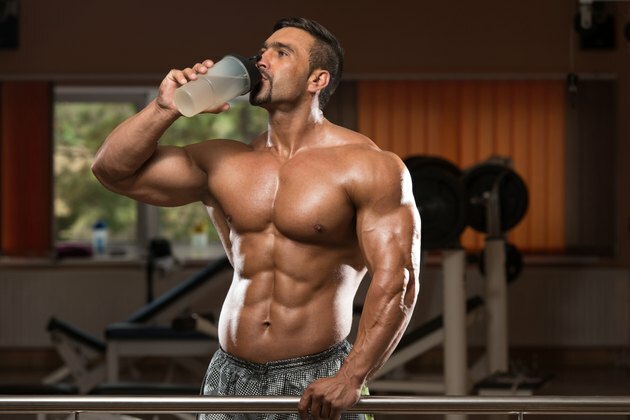 For bodybuilders performing more than 60 minutes of moderate- to high-intensity exercise, replacing the lost sodium will help improve recovery time and restore fluid levels to normal. Consume fluid replacement drinks that contain sodium to maintain normal electrolyte levels in your body. The recommended daily sodium intake for healthy Americans is 1,500 milligrams daily, with a maximum daily limit of 2,300 milligrams. This recommendation may be slightly higher for bodybuilders and high-intensity athletes, because it is important to replace the sodium lost in sweat. Because every individual sweats at different levels, there is no clearly defined level of sodium replacement for exercise. The American Dietetic Association, Dietitians of Canada, and the American College of Sports Medicine recommend that athletes weigh in before and after exercise to determine sweat loss, and then consume 16- to 24-ounce carbohydrate-electrolyte fluid for every pound lost in sweat. To replace the sodium lost during a workout, choose carbohydrate-electrolyte sports drinks. The American Dietetic Association, Dietitians of Canada, and the American College of Sports Medicine recommend athletes consume sports drinks containing about 6 to 8 percent carbohydrates and 0.5 to 0.7 grams per liter of sodium, especially during exercise lasting longer than two hours. Most popular sports drinks meet these guidelines. Sodium losses can also be replaced by consuming liquids that contain salt such as soups and vegetable juice. Consuming salty foods and snacks can also compensate for sodium lost during exercise. Choose snacks such as whole grain salted tortilla chips or salted crackers after intense or prolonged exercise. Be aware, the typical American diet is well above the daily sodium recommendation. If sodium consumption is already high, you don't need to eat sodium-rich foods to replace sweat losses. According to the American College of Sports Medicine, women typically have lower sweating rates than men. Factors that may contribute to this include smaller body size, lower metabolic rate when performing exercise, and less wasted sweat. For this reason, female bodybuilders may not need to consume as much additional sodium as male bodybuilders. Additionally, individuals with larger body sizes may need to increase their sodium intake because of increased sweat rate.